It can be a worrying time when your child is unwell. We understand that sometimes you don’t want to wait for a prognosis or perhaps a second opinion. Nuffield Health hospital in Chester is able to offer a fast diagnosis, as well as rapid access to first class private treatment. Nuffield Health Chester Hospital, The Grosvenor can provide you and your family with a number of consultants and specialised children’s nurses that can see children from newborn to 3 years of age for consultation and can carry out treatment for children from 3years and over. Designated weekend pre-assessment clinic for children. Nuffield Health shares a commitment to safeguard and promote the welfare of children and young people. 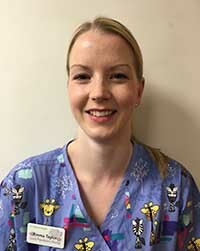 Hi, my name is Emma Taylor and I am a committed and compassionate paediatric nurse with over 10 years’ experience, caring for children from 0-16 years. I initially qualified at Salford University were I obtained a degree in children's nursing. The majority of my work has been in the NHS on a dedicated children's unit, here I gained progressive experience rotating in medical, surgical and high dependency areas. This involved caring for children with common childhood illnesses and chronic conditions requiring emergency and routine treatment. Over the last few years I moved over to the private sector supporting children and families accessing inpatient and outpatient services. To progress my career further, I recently joined Nuffield Health Chester Hospital, The Grosvenor as lead paediatric nurse for children and young people. Here at Nuffield Health we realise that bringing your child into hospital can be very worrying, we therefore have paediatric nurses on hand to give the appropriate advice, guidance and support as needed. The most rewarding part of being a paediatric nurse is working with children and their families to make those experiences they may view as unpleasant to be much more positive. A lot of the time children may be anxious and unable to understand why they need to come into hospital, I thoroughly enjoy finding a way to effectively communicate with them providing age appropriate play and distraction to help them through the process. It’s easy to arrange an appointment with one of our specialist consultants. All you need is a referral letter from your GP. You can use your insurance or pay as you go. You and your child are welcome to come and have a look around the hospital and meet staff prior to admission. For more details or to book an appointment please contact 01244 684 325 or fill in the enquiry form on the right and we’ll call you back.